This example shows how to convert a USGS DEM into a regular latitude-longitude grid having comparable spatial resolution. U.S. Geological Survey (USGS) 30-meter Digital Elevation Models (DEMs) are regular grids (raster data) that use the UTM coordinate system. Using such DEMs in applications may require reprojecting and resampling them. You can readily apply the approach show here to projected map coordinate systems other than UTM and to other DEMs and most types of regular data grids. This folder is on the MATLAB® path if the Mapping Toolbox™ is installed, so it suffices to refer to the data set by filename alone. You can use the sdtsinfo command to obtain basic metadata about the DEM. and you can use sdtsdemread to import the DEM into a 2-D MATLAB array (Z), along with its referencing matrix (refmat), a 3-by-2 matrix that maps the row and column subscripts of Z to map x and y (UTM "eastings" and "northings" in this case). You can convert refmat to a map raster reference object, which provides a more complete and self-documenting way of encoding spatial referencing information. indicates use of the North American Datum of 1927. The Clarke 1866 ellipsoid is the standard reference ellipsoid for this datum. which indicates that the horizontal coordinates of the DEM are in units of meters, and use both pieces of information to construct a referenceEllipsoid. you can tell that the DEM is gridded in a Universal Transverse Mercator (UTM) coordinate system. indicates which longitudinal UTM zone was used. The Mapping Toolbox utm function, however, also requires a latitudinal zone; this is not provided in the metadata, but you can derive it from the referencing matrix and grid dimensions. UTM comprises 60 longitudinal zones each spanning 6 degrees of longitude and 20 latitudinal zones ranging from 80 degrees South to 84 degrees North. Longitudinal zones are designated by numbers ranging from 1 to 60. Latitudinal zones are designated by letters ranging from C to X (omitting I and O). In a given hemisphere (Southern or Northern), all the latitudinal zones occupy a shared coordinate system. Aside from determining the hemisphere, the toolbox merely uses latitudinal zone to help set the default map limits. So, you can start by using the first latitudinal zone in the Northern Hemisphere, zone N (for latitudes between zero and 8 degrees North) as a provisional zone. then convert latitude-longitude, taking advantage of the fact that xCenter and yCenter will be the same in zone 19N as they are into the actual zone. Then, with the utmzone function, you can use the latitude-longitude coordinates to determine the actual UTM zone for the DEM. Finally, use the result to reset the zone of the axes constructed earlier. Note: if you can visually place the approximately location of New Hampshire on a world map, then you can confirm this result with the utmzoneui GUI. Use mapshow (rather than geoshow or meshm) to display the DEM on the map axes because the data are gridded in map (x-y) coordinates. The DEM covers such a small part of this map that it may be hard to see (look between 44 and 44 degrees North and 72 and 71 degrees West), because the map limits are set to cover the entire UTM zone. You can reset them (as well as the map grid and label parameters) to get a closer look. 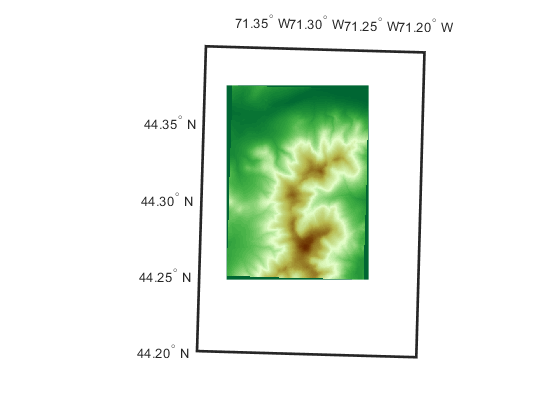 The next step is to define a regularly-spaced set of grid points in latitude-longitude that covers the area within the DEM at about the same spatial resolution as the original data set. First, you need to determine how the latitude changes between rows in the input DEM (i.e., by moving northward by 30 meters). 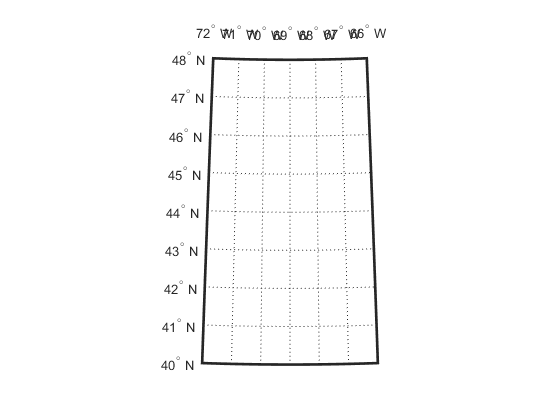 The actual spacing can be rounded slightly to define the grid spacing to be used for the output (latitude-longitude) grid. To set the extent of the output (latitude-longitude) grid, start by finding the corners of the DEM in UTM map coordinates. Then convert the corners to latitude-longitude. Display the latitude-longitude corners on the map (via the UTM projection) to check that the results are reasonable. Next, round outward to define an output latitude-longitude quadrangle that fully encloses the DEM and aligns with multiples of the grid spacing. Finally, construct a geographic raster referencing object for the output grid. It supports transformations between latitude-longitude and the row and column subscripts. In this case, use of a world file matrix, W, enables exact specification of the grid spacing. Rlatlon fully defines the number and location of each cell in the output grid. Finally, you're ready to make use of the map projection, applying it to the location of each point in the output grid. First compute the latitudes and longitudes of those points, stored in 2-D arrays. Then apply the projection to each latitude-longitude pair, arrays of UTM x-y locations having the same shape and size as the latitude-longitude arrays. At this point, XI(i,j) and YI(i,j) specify the UTM coordinate of the grid point corresponding to the i-th row and j-th column of the output grid. The final step is to use the MATLAB interp2 function to perform bilinear resampling. At this stage, the value of projecting from the latitude-longitude grid into the UTM map coordinate system becomes evident: it means that the resampling can take place in the regular X-Y grid, making interp2 applicable. The reverse approach, un-projecting each (X,Y) point into latitude-longitude, might seem more intuitive but it would result in an irregular array of points to be interpolated -- a much harder task, requiring use of the far more costly griddata function or some rough equivalent. View the result in the projected axes using geoshow, which will re-project it on the fly. Notice that it fills the blue rectangle, which is aligned with lines of latitude and longitude. (In contrast, the red rectangle, which outlines the original DEM, aligns with UTM x and y.) Also notice NaN-filled regions along the edges of the grid. The boundaries of these regions appear slightly jagged, at the level of a single grid spacing, due to round-off effects during interpolation. Move the red quadrilateral and blue quadrangle to the top, to ensure that they are not hidden by the raster display. Mt. Washington quadrangle, with elevation in meters.